Pieces Of My Soul Puzzle. My Inner Body is Comforted in Meditation, Mantras, Play, and Love. My Outer Body, is comforted by Exercise, Yoga, Bathing, Nourishment, and Rest. My Surrounding Body is Comforted by Security and Order. Yogi Bhajan says, The Strength That Supports You, Is the Spirit Within You. If You Don’t Let The Spirit Play, You Will Not Have The Strength To Win. Where is my Spirit’s play?! But where is my Play today? And Where is my Love? I don’t feel Serious, in that too grown up way. I don’t feel depressed, and never really do anymore. Yet where is the Fun, the Joie D’vivre?! And O! Wherefore art thou, My Raison D’etre? My Long Lost Invigorator! How ENLIVENING is the Mission!!! Years since I’ve Known My Purpose, My Reason. Before these years, my Soul was on Fire! I simply Better My Being and Better My Doing. Better Being and Better Doing. But they don’t Light My Fire. It is Good, but it doesn’t turn me on. This does not mean I am not Grateful. I am Grateful for every moment I am not suffering. This is a wonderful teaching of The Buddha. Remembering this, opens Joy a bit more. When I Know What I Am For. She let it stop her. She began to Rise UP! She found Truth, and Yoga, and Meditation, and The Magic of This! And her Life Reformation Steadily Ascended. Yet what of You, Enthusiasm? And what of You, Passion? And what of, Bounding Out of Bed with Zeal each day? Looking Forward To the Fun, Forwarding Thing? Am I To Lose These Aspects Forevermore? It is the Truth of Most of My Life. But what happens when the Wild Child becomes Sensible? The Cards point to a Union Of Opposite Energies. I know the Truth: Day Needs Night. Right Needs Left. Up Needs Down. The World of Form Is the Realm of Opposites. and not be Devoured From Within and left Hollow again? And not feel the Thrill anymore? and Life Gets A Little Weird. But in me, it has never been Contained. Life can be Torn Apart. So May I Try Both? And what would She of the Sun AND the Moon Look Like? in Her Day AND Her Night? in this life of applying herself to Good alone each day? Must there be a Self at all? Need an identity of its own? but am I now just viewing them from the other side of the coin? Was there merit in the Shadow? Can I see it from the Light? Have the Wish I Wish Tonight . . .
And I Need The Light To Voyage By. That Thing I Couldn’t NOT Be! That Thing I Couldn’t NOT Do! What is this Mission Now? The Day Has Been So Very Long. Has it occurred to you that now may not be the time to Voyage? Accept It, Deal With it, Embrace Your Pain, And Stop Running From It? When You Build Strength and Fully Restore. To Run Toward Your Light, Not From your Life. And You Need To Face It, Accept It, Own It, Heal up, And Rise Above It. Aye, I Hear You Voice-That-Guides-Who-Speaks-In-IItalics . . . . So no cool boat trip? Not what I wanted to hear, though I thank You For Your Wisdom. It is always Right, Always Best, And Saves Me Time And Again. 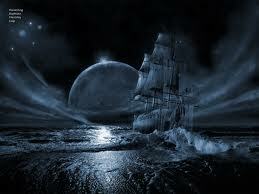 Yet Until Such Time as I May Voyage . . . .
Might I Dream Untimely Needs? Once Conquered, Strengthen Flesh and Heart! I’ll Never Lose Myself Again. This entry was posted in Uncategorized and tagged channeling, Journey, Resurrection, Soul, Voyage by thevoicethatguides. Bookmark the permalink. Well, I’m still alive, lol. A totally inspired. All things. All one. And one more thing,,, I love that The Voice That Guides speaks in italics!